On June 28th 2013, Sony's PlayStation Plus service celebrated a milestone as the Instant Game Collection turned 1-years old. In total, 64 games have been added to the Instant Game Collection in the past year. It's estimated that roughly $1,000 worth of games were available for download, for a subscription price of only $49.99. 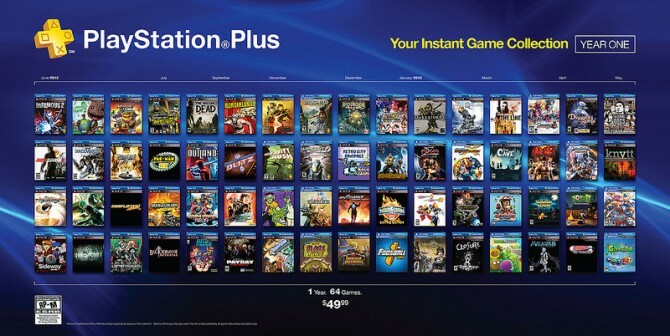 For those of you who don't know, PlayStation Plus was first introduced in 2010 as an alternative to the free PlayStation Network provided to all PlayStation 3 users. If you choose to subscribe PlayStation Plus you receive a selection of free games from Sony that you can play to your heart's content; as long as you remain a subscriber to the PlayStation Plus service. The longer you remain a subscriber, the more Instant Games you are rewarded with. Most of the games in the Instant Game Collection aren't huge blockbusters. However, Sony occasionally released larger titles into the mix to make PlayStation Plus something really worth subscribing to. In the first year of PlayStation Plus, Sony added games such as Wipeout HID, Critter Crunch and Sackboy's Prehistoric Move. In 2011, we saw larger titles added with games such as Plants Vs Zombies, Dead Nation, Cornet Crash and Burn Zombie Burn. Finally, 2012 saw the biggest titles yet with games such as Little Big Planet 2, inFamous 2, Saints Row 2, Borderlands, Bioshock 2 and Just Cause 2. To celebrate the 1-year anniversary Sony will be adding titles that are simply A-rated on the scale from A-Z. X Com Enemy Unknown, Uncharted 3, Little Big Planet Karting, Saints Row 3, Deus Ex Human Revolution and Machinarium are the 6 free games that Sony will be adding to the Instant Game Collection for July 2013. I must say, that's a lot of games. Did you download any? If so, which ones did you enjoy? Let us know in the comments below.